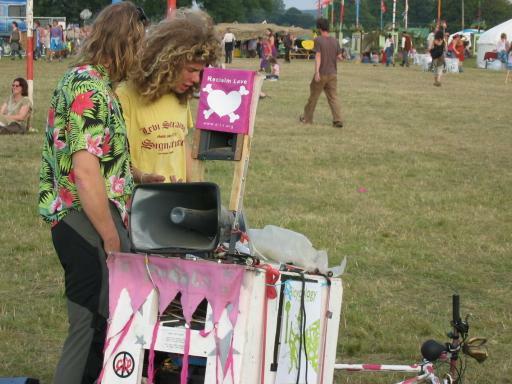 Pedals the sound system…perhaps you’ve seen it at Critical Mass or at a protest. It was built originally for the 2005 G8 protest ride from London to Scotland! Since then it has appeared at innumerable protests/bike rides/protest bikerides, most likely in part due to both it’s impressive sound and durability: “Pedals set the standard for mobile sound with its incredible volume, sound quality, and low power consumption thanks to features like a 6th order bandpass bass enclosure, class D amplifiers, and a highly efficient horn speaker and tweeters” (Bicycology). How to DIY your own? Here are also some photos and links to check out of mighty Pedals through the years! Pedals and Son of Pedals around 2008. Both made by bicycology.